We always invite someone who has never been before. We clean the house and give away any “leavened” foods. We do not eat any leavened foods for 8 days to commemorate the escape from slavery. The only bread allowed is matzo – unleavened bread, the bread of affliction. 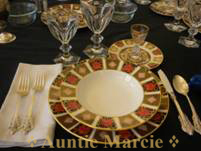 Set table with “Passover” china. Different…be different from every other night. Passover is special. It is a night to be different, to savor our freedom with our most beautiful possessions and a celebratory meal. Write a meaningful ceremony. Give everyone a part and put their page at their place setting. My ceremony is printed at the end of the section. There are about 30 pages. Every year I have 20 people or so. in addition to the ceremonial pages, I pick and choose the extra pages full of ideas and poems and readings so each year the ceremony is a little different. I always get the “shmura” matzo…it is supposedly made from the “first” wheat harvest (I don’t really care about that) and it is whole wheat (I do care about that!) It is so much more delicious than boxed white matzo which truly tastes like cardboard. It is thinner and has more flavor. Sometimes Ralphs sells it. Usually I order it from Shotzer Hand Matzoh (718) 435-2873. Set the table a few days before so the house looks beautiful – I always enjoy looking at the gorgeous table. I got this habit from mom (Bubbe). Put a little cup filled with salt water at each setting – I use sherry glasses (that way, when you’re doing the ceremony no one has to pass anything and it goes much faster). 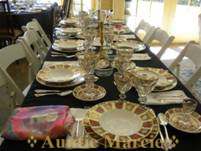 Put a Passover Hagada, or a part from your written ceremony, at each place setting. My ceremony can be downloaded below. You do not set out any appetizers on Passover. People come and expect to sit down to the ceremonial meal. When done, don’t forget to leave the cup for Elijah on the table and open the door so the prophet of peace can enter your home. Gefitle Fish – Always the traditional Passover first course. My grandmother’s was light as a feather, fresh and delicious. I never took the time to learn, and now this is my approximation. Chicken Soup with Matzo Balls – serve the broth, a few carrots and make the matzo balls ‘mini’ size. Measurements are less important than the result - use as many walnuts as you think you need. I need one quart so I use 3 cups of nuts, 2 apples, ½ - 1 t. cinnamon and 1 – 2 shredded apples. Put the walnuts into the Cuisinart and do a rough chop. Not too fine. I shred the apples in the Cuisinart with the shredder blade. Mix together. Add the cinnamon and wine to taste. Delicious. Make a lot. People like it. You need it for the Seder plates and the ceremony. It is best fresh and does not keep well. Put all ingredients in a small pot. Add water generously to cover. Simmer covered for 20 minutes. Turn off heat and let sit in the pot until thickened a bit. Serve on buffet next to meat. The taste wonderful together. In our family it was a big joke that matzo is ‘binding’, so my grandparents always had to have the stewed fruit…now Uncle Mike’s favorite, we can’t have Passover without it. Peel potatoes, keep in cold water or they turn dark. Peel the onion; slice them to fit into the food processor tube. Using the shredding blade, feed the potatoes and onions alternately until all are shredded. Empty into colander suspended over a bowl. Change blade from shredder to chopping blade. Put back half of the potatoes and onions and process until coarsely chopped — not too fine. Do same with remaining potatoes and onions. Drain again in colander over a bowl. Press moisture out. Transfer drained potato and onion mixture into mixing bowl. Pour off the liquid from the drained potatoes and onions and scrape the thick starch back into the chopped mixture. Mix in the egg yolks, salt and pepper, parsley and matzo meal if you are using it. Beat egg whites to stiff peaks and fold in. Fry in corn oil. For old world original flavor, put ¼ cup chicken schmaltz and ¼ slice of onion into corn oil to flavor it while frying the latkes. Replace onion as it blackens, with a fresh piece. Drain on brown paper bags. Serve with Sour Cream and Applesauce. *Potatoes used to be small – the size of your palm. We used 7-8 in those days. If using today-sized potatoes, 3-4 equals 7-8 original size potatoes. Recipe coming after I make them on Wed.
Passover style is with a few soup vegetables and matzo balls. No chicken. You will have a heavy meal after the soup so save the chicken for other uses. I always keep stocks in my freezer saved from cooking meats and vegetables. But I use Manischewitz matzo ball mix to which I add my secret ingredients….They come out light as a feather and there are NO bad additives. Completely ok. Homemade matzo balls always come out leaden. Try it, you’ll see. Mix the matzo ball mixture according to the package directions. Add ½ cup finely chopped parsley and the chopped green ends from one bunch green onions. Drop them into boiling water. Cook them for 45 minutes. DO NOT cook them in the soup. They do not come out well, and it ruins the soup. Take a ¼ cup of the stock and heat it in the bottom of the soup pot. Add the onions, carrots and celery and brown them in the stock. You don’t want added oil or fat in the soup. Add the stock and bring to a boil. Add the parsnip and parsley. Turn to simmer and cook 20 minutes. Drain the matzo balls and add to soup along with the sliced green onions. Heat oil in large skillet and sauté onion until tender. Add carrots, celery, bay leaves, fresh herbs, and parsley, wine and tomato sauce. Simmer. Season to taste with salt and pepper. Rinse lamb. Salt and pepper both sides. Place in a covered roaster with a loose fitting lid. I prefer granite ware. Sauté mushrooms in hot oil in a separate skillet until golden brownand crusty. Combine with cooked sauce. Spoon over lamb. Cover and cook for 2 hours at 375°. Uncover and cook additional 20 – 30 minutes until nice and caramelized on top. Wash, trim, and rub brisket with salt and pepper and put in roasting pan fat side up. Chop 2 onions, 4 stalks celery and parsley and cover brisket with it. Mix 1 jar of Heinz Chile Sauce with one jar water and pour over on top of onions etc. Bake 1 hour uncovered at 325° (yes, do it). Remove from oven and add 1-10 oz. bottle of beer. Cover and cook 3 more hours. Cool and refrigerate. Slice when cold. Remove fat from juices. Then day of Passover reheat in juices. Incredible. Choose Asparagus and or Green Beans of your choice. We like the thick Asparagus and the Haricot Verts. Chop up an heirloom tomato into small dice. Lightly steam the veggies for 3 minutes in simmering water. Drain and place onto a platter. Spoon the diced tomatoes on top with the juices. No need to add salt or pepper. The meat and side dishes have plenty. These veggies with the tart tomatoes create a perfect balance to the meats and latkes. Melt butter and sugar together. Pour over matzoh, spread evenly. Bake 5 minutes at 350°. Sprinkle chocolate chips on top. Bake 5 minutes more. Spread chocolate evenly. Quickly spread slivered almonds over top. Preheat oven to 300°. Butter and sugar a spring form pan. Melt chocolate and butter in a double boiler. Remove from heat and set aside. Place egg yolks, whole egg and 2/3 cup of sugar in a bowl and beat until mixture is thick and pale yellow. Place egg whites in the bowl of an electric mixer fitted with whisk attachment. Add 1/3 cup of sugar and whisk until mixture is stiff. Pour the chocolate mixture into egg yolk mixture and whisk until well mixed. Gently fold in egg white mixture until just combined. Pour cake batter into prepared pan and bake for about 50 minutes to an hour. Cake will be set but jiggly. Test with knife. It will be coated but cooked. Let the cake cool completely in the pan and then unmold. you will see that the cake will hold it's shape better. Do not refrigerate. Before serving gently heat in microwave or oven for a few minutes. Serve warm. Center will be gooey. Here you can download my Passover Seder. I vary it a little each year to apply to current events, but this gives you the essence which you can modify as you desire.